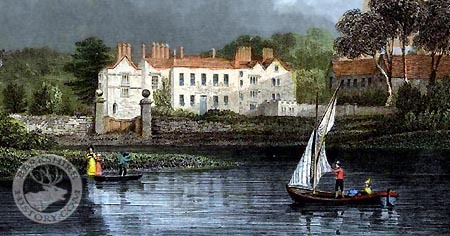 The first Ladye Place (sometimes spelt Lady Place) in Hurley was probably built in the reign of King Edward VI by John Lovelace who had purchased the manor, at the font in St. Paul's Cathedral, in 1545. It was converted from the infirmary of the old Priory of Hurley which had been dedicated to Our Lady St. Mary. John wrote his will at 'the mansion called Ladye Place' in 1558. His son, Richard Lovelace Senior, made a fortune as a pirate with Sir Francis Drake in the Caribbean and probably used the money to rebuild the house as a superb example of the typical H-plan building of the period, with a three-storey porch, oriel-type windows and Dutch-style gables. His son, Richard, the 1st Baron Lovelace, grew up there, inherited the estate in 1602 and was then followed by his own son, the 2nd Baron. This John Lovelace was an ardent Royalist during the Civil War and, while he was away fighting in 1642, the house was pillaged by Parliamentary soldiers, his widowed mother being "plundered almost to her smock". Later, in the 1670s, his son and namesake, the 3rd Baron Lovelace, magnificently embellished the building's interior with fabulous painted rooms and ceilings, the latter by Antonio Verrio, probably undertaken by him at the same time as those produced for Charles II at Windsor Castle. During the short reign of James II, the 3rd Baron held private meetings with some of the leading nobles of the kingdom in the subterraneous vault under the Great Hall, calling for the Prince of Orange to take the English Throne as William III. It is even said that the principal papers which brought about the Glorious Revolution were signed in the dark recess at the extremity of the vault. It is certain, that after King William obtained the Crown, he did visit Lord Lovelace at Ladye Place and descended with him down the dark stairs to see the vault. Apart from the garden wall and ball-finial capped gate-piers, this vault is all that remains of Ladye Place. It is usually stated to have been part of the original priory. The 3rd Baron had lived such a splendid extravagant life that, when he died in 1693, his cousin, who inherited both title and estate, was forced to sell Ladye Place, by order of the Court of Chancery, in order to settle his enormous debts. The house and manorial rights were separated. Most of the land and rights were purchased by Robert Gayer and then by the 4th Duke of Marlborough in 1817. The 5th Duke exchanged them for lands in Oxfordshire with Thomas Walker of Woodstock in the same county. From his grandaughter, Deborah Susannah Freind, they passed to her husband, the 4th Viscount Ashbrook who lived at Beaumont Lodge in Old Windsor. The house, however, was bought with part of a massive lottery win of £20,500 (today about £1.5m), from only two tickets. The purchaser was Margaret, the sister of Rev. Dr. Joseph Wilcocks, Bishop of Rochester, and widow of Mr. John Williams of Westminster, Middlesex. Their daughter, also Margaret, married the Bishop's chaplain, Rev. Dr. Edmund Lewin from Broxbourne in Hertfordshire. They eventually inherited Ladye Place in 1745, before it passed, in 1763, to the lady's cousin, Joseph Wilcocks Junior, the Bishop's son. Being unable to let the house to a tenant, he decided to move in himself. He was a well-known writer and philanthropist who entertained General Paoli at Hurley in 1780 and King George III five years later. He placed inscriptions in the vault recording their visits, as well that of William III. When Wilcocks died suddenly in 1791, the house was inherited by Captain Gustavus Adolphus Kempenfelt, a Swede but apparently a distant relative. He was brother of the famous Rear-Admiral Richard Kempenfelt whom he had lost nine years earlier when he went down in the Royal George off Portsmouth during botched repair work. The story that the two brothers planted two fine thorn-trees in the grounds, one of which unexpectedly withered on the day of the Admiral's death, is therefore purely apocryphal. Kempenfelt died on 14th March 1808 and left Ladye Place to his maternal cousin, Richard Troughton, who lived there for nearly twenty years before his own demise on 28th September 1826. The house was then purchased by Hon. Henry Walker but stood empty and neglected for eleven years, before its final demolition in late 1837. The present building called Ladye Place is an old farm-house named after the original mansion just west of the parish church. As noted, Ladye Place was an Elizabethan building with a plan like the letter H, the north front having been almost similar to the south front. It stood partly on the ancient stone foundations of the infirmary of Hurley Priory, although the celebrated vault may not have survived from this structure as is often supposed as its super­structure is of brick, excepting the west wall which is partly of chalk. The second storey was adorned with Tuscan pilasters and, the third, with columns. The gables of the dormer windows were round-headed and, on the north front, between them, were obelisk-like pinnacles. The south, or principal, entrance was Tuscan, and had over it the arms of Lovelace quartering Eynsham, and the windows, of which some were bared, had mullions and square heads. The parapet was plain, as were the chimneys, though some were octagonal. Inside, the centre was occupied by a very striking hall and magnificent staircase. This hall was spacious, but of irregular plan and height, its staircase portion having been lofty. The other portion was much less irregular, and had its ceiling sustained by two wooden columns, with well-worked Corinthian capitals. There was an elegant chimney-piece of black marble, mantle and jambs flanked with carved pilasters, and surmounted by an entablature, on the frieze of which, carved, painted and gilt, were the Lovelace and Eynsham arms and supporters. The panelling of this hall was, however, not of the highest quality, having been merely of mahogany-coloured deal, slightly moulded. The staircase and its gallery had a railing of small twisted balusters. The steps were of deal and perhaps of compa­ratively late erection. However, the walls and ceiling of the stairs were well worthy of observation, having been embellished with groups of foliage, flowers, fruit, birds and instruments of war, the chace and music, interspersed with the arms and crests of the Lovelaces and associated families, all beautifully executed in high relief, partly of plaster and partly of papier-mâché and in excellent preservation. The arms were those of Lovelace, quartering Eynsham, Wentworth and Pye, from which it would appear that they were probably put up between 1680 and 1690. Here and there, among the foliage, were stags at gaze, the Wentworth crest, and monograms of the word Lovelace. In the hall were the modern arms of Westminster Abbey and, in the principal chambers, were those of Lovelace and Eynsham with supporters, Lewin and Williams, and of Rev. Dr. Joseph Wilcocks as Bishop of Rochester and Dean of the Order of the Bath. There was also a shield charged with a single crescent and a fleur-de-lis and, on a black shield, a mono­gram of the first Greek letters of the word Christ, curiously supported by swords and spears. Some rooms had very old wallpaper, while others had their panels coloured like marble and another had small panels painted in blue and white with subjects resembling those of Dutch tiles. The room which attracted the greatest admiration, however, was the ‘saloon’, above stairs. This was about forty-four feet long by twenty-four feet wide, and surrounded by landscapes in chiaroscuro on deal panels of various sizes, from fourteen inches by thirty-two inches to four feet six inches by six feet six inches. They were all painted in oil in a free style, the small ones with a greenish-grey colour, but the large ones with reddish-brown, the highlights of all being put on with silver lacker. They were views of the wild scenery of Calabria and more probably from the pencil of Pietro Tempesta than of Salvator Rosa, to whom they were attributed. The ceiling was also in oil and not improbably by Verrio, having been well designed and finely coloured. It represented an assemblage of gods and goddesses, previous to a banquet, as was supposed from a curious cooking scene introduced in one corner, the principal figure of which held a large knife, while another had a spit on which were two fowls and several boys, winged like angels carried fruit. The figures of these cooks were probably interpolations by one Francis Thorn of Vauxhall who was employed to restore the ceiling and varnish the paneling at the turn of the 19th century. In this mansion were, no doubt, several portraits of its ancient possessors. Certainly there was one of the unfortunate Admiral Kempenfelt, now in the National Maritime Museum in Greenwich. After the building's demolition, some of them, were housed for a while in a nearby farmhouse. One represented a person in ecclesiastical robes, perhaps Bishop Wilcocks, another was the portrait of a king, probably King William III, and, another, that of a lady. The Lovelace portraits had been removed some time earlier and at least one was sold in 1838 by a picture dealer in Marylebone Street, London to a gentleman of the Milbanke family in the north of England. Having been tenantless for eleven years, in December 1837, the owner decided to dispose of this historic mansion which was, by then, in a considerable state of disrepair. It was first offered for sale for £500, but, having no takers, the house, fixtures and furnishings were divided up into lots for public auction. This realised a total of £1,500 because there was so much competition amongst the locals for its orna­mental portions. Mr. Budd, a solicitor from Newbury, expended nearly £300 for about thirty of the panels, the columns and the fireplace in the hall, with the staircase and stairs. A few of the best panels were purchased by Fuller Maitland of Park Place in Remenham, and two pairs of panels, six feet four inches by four feet two inches, by Mr. Preece, a Maidenhead upholsterer. Others were bought by a Mr. Green of High Wycombe. The painted ceiling, unfortunately, crumbled to pieces upon the removal of its framework, but a few of the heads were preserved by Mr. Freebody, a carpenter from Hurley. All the beautiful papier-mâché works, which came off the ceiling with but little injury and were about twenty in number, were purchased by Mr. Bond, a builder from Marlow, who sold them in London. The house was demolished shortly afterwards.